This figure was provided by Angolz.com. Go go Power Ran -- Wait, this Super Sentai hasn't been turned into Power Rangers yet? Okay, guess I better watch the show, then. So let's see, millions of years ago some aliens nearly killed the dinosaurs until they were stopped by the Zyudenryu and now the aliens are back. 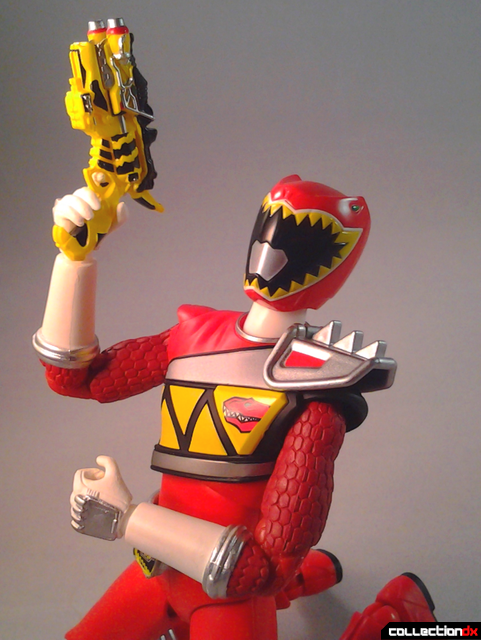 Time for a new generation of Zyudenryu, which basically means rangers in dinosaur costumes with robot dinosaurs. That always works for me. 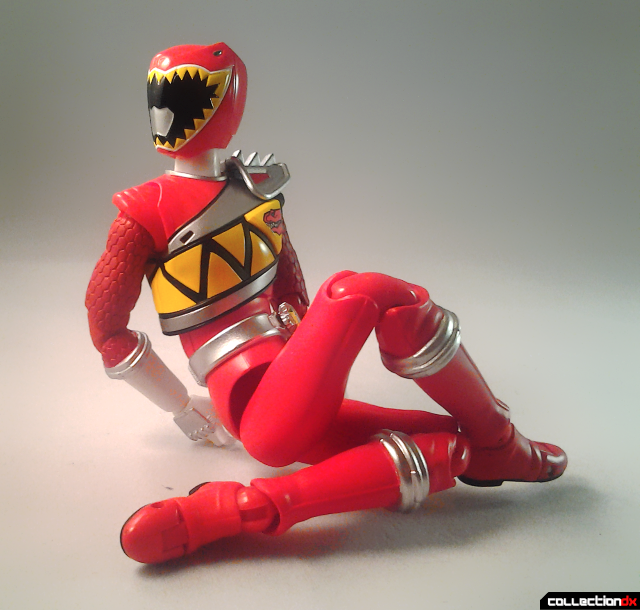 This isn't the first time we've had dinosaur themed Super Sentai. That was Dinosaur Squadron Zyuranger (Kyoryu Sentai Zyuranger or 恐竜戦隊ジュウレンジャー), made famous outside of Japan through the original Mighty Morphin Power Rangers adaptation. A second dinosaur Sentai show followed a little over a decade later, Blastosaur Squadron Abaranger (Bakuryu Sentai Abaranger or 爆竜戦隊アバレンジャー). 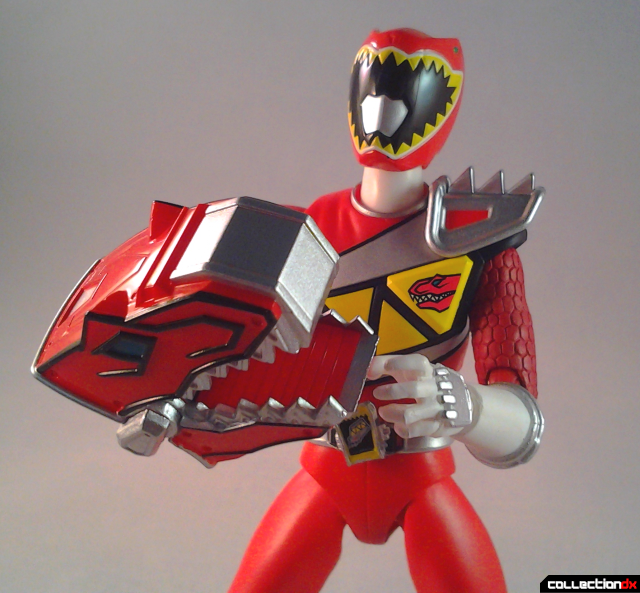 Abaranger became Power Rangers Dino Thunder, a show that saw the return of Tommy Oliver from the original Mighty Morphin Power Rangers. Just over twenty years after Zyuranger, Toei introduced Voltasaur Squadron Kyoryuger (Jyuden Sentai Kyoryuger or 獣電戦隊キョウリュウジャー). While the story of Kyoryuger is not actually connected to Zyuranger, the costumes are clearly heavily inspired by the 1992 look. 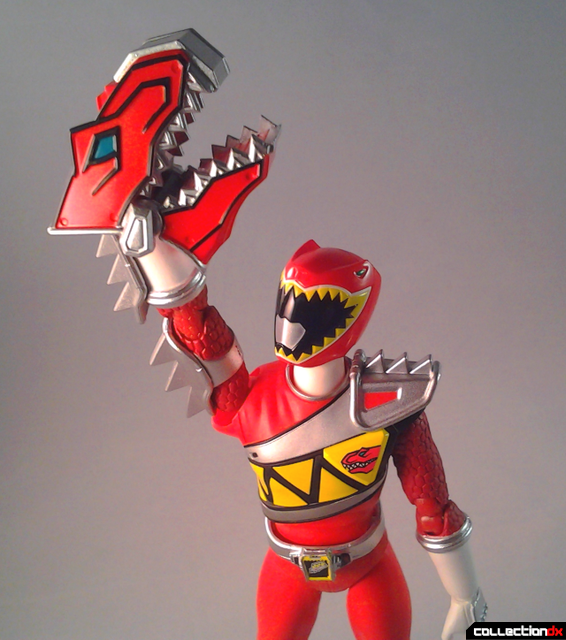 In fact, from the tooth motif to the "dinosaur eating a guy's face" helmet design, they may as well just be updates of the Zyuranger suits. They do have some unique elements, though. I like the scaly sleeves that suggest both chainmail and reptile skin. The protective armor on the shoulder is a nice touch and I like the bright yellow "sash" across the chest in the shape of dinosaur teeth. 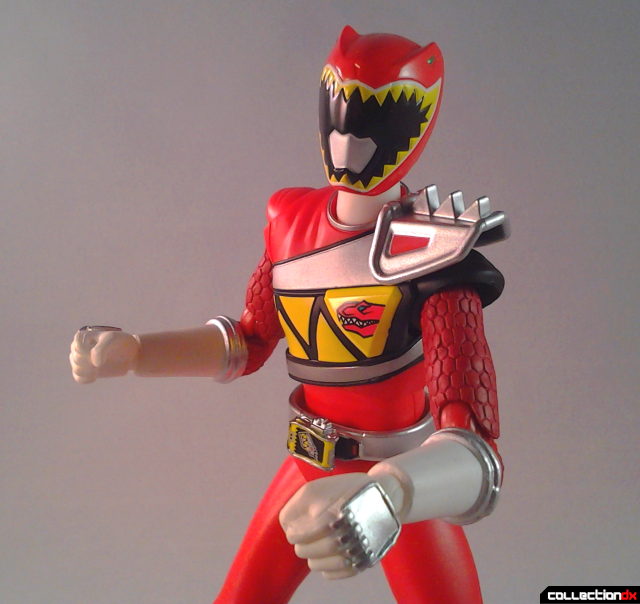 It reminds me of the diamonds on the Zyuranger outfits but it is a bold new design that draws the eye. Another cool innovation is a swappable right arm that has spiky armor. You can even replace the hand with a dinosaur head and menace your other S.H. 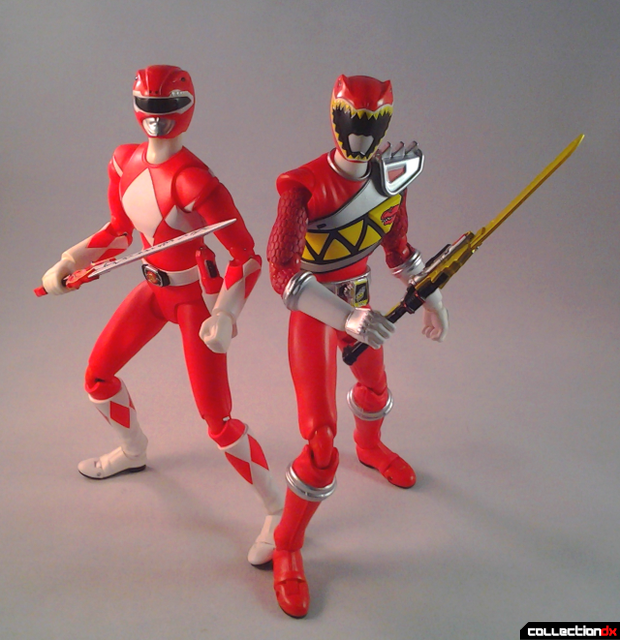 Figuarts toys! This is kind of a silly feature, but Kyoryuger is kind of a silly show. 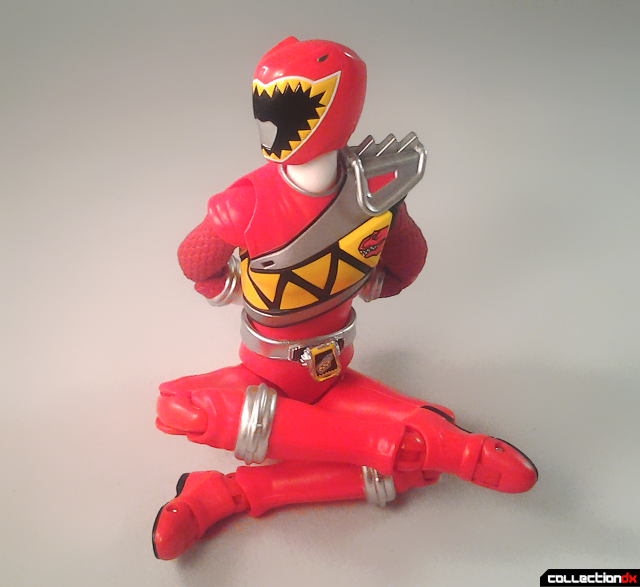 If I have a complaint about the Kyoryuger Red figure, it's not actually the toy's fault, but rather the original design. It sort of bothers me that the human face part of the helmet has become so abstract it's just kind of a little patch of silver. I know some people think the unmoving human mouth and nose of the original Zyuranger costume is a little silly, but I feel like I don't really have a face to look at with this helmet. It's a minor nitpick though. 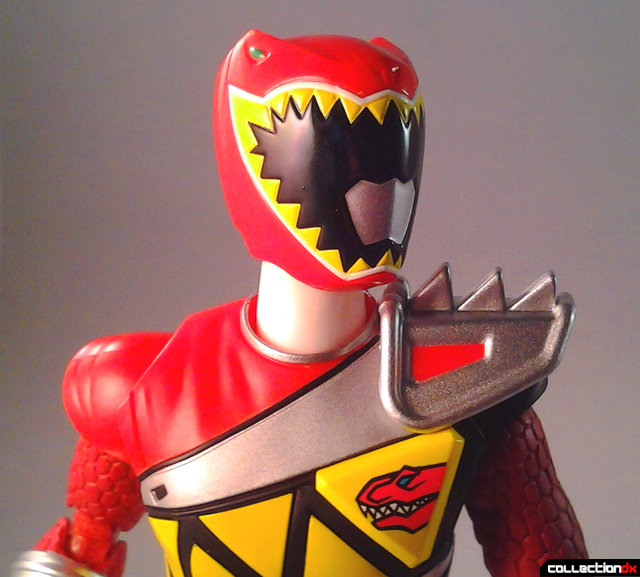 I really like the way the dinosaur head and teeth design on the helmet looks more aggressive than the one on the Zyuranger helmet, I just wish there was more human face in there. 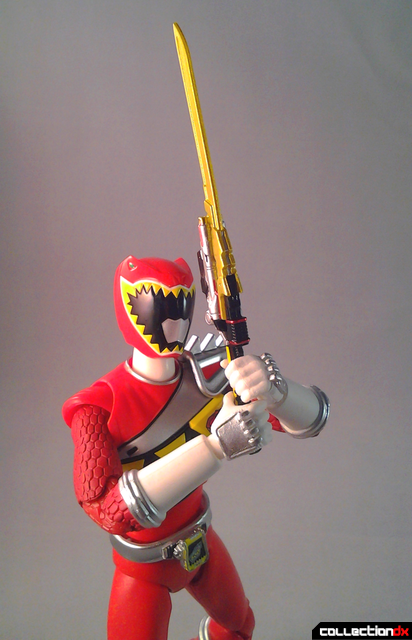 Kyoryu Red comes with a couple of show accurate weapons. First there's the Gaburicalibur, a cool looking gold and silver sword with red accents. It is surprisingly detailed and has very nice paint work. 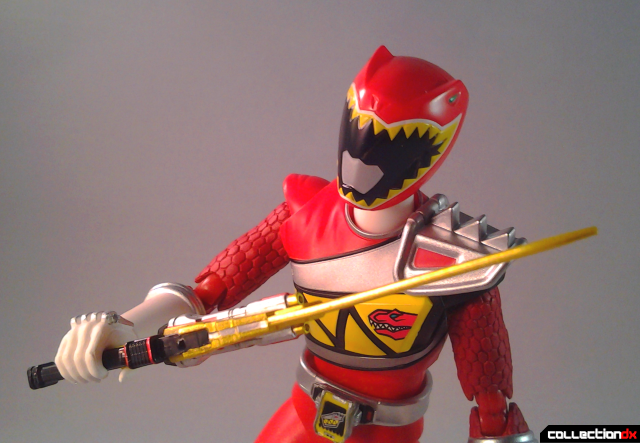 While I realize the design is more complex than Tyranno Ranger's Dragon Attack Sword (Ryugekiken), I'm still a little surprised at what a good job Bandai did on this. "By the power of Dinoskull! I have the power!!" "Home of the nice slice!" The other weapon is the Gaburevolver. 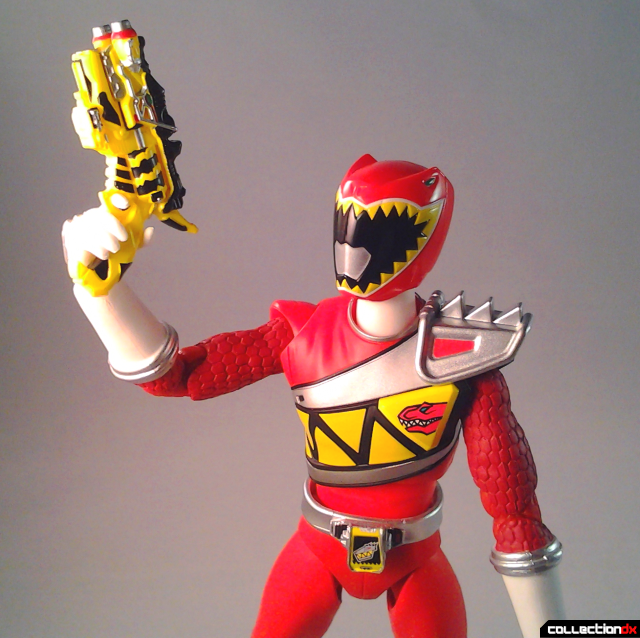 Now you may be thinking, "Well hey, every ranger has their trusty sidearm, right?" Well, not exactly. 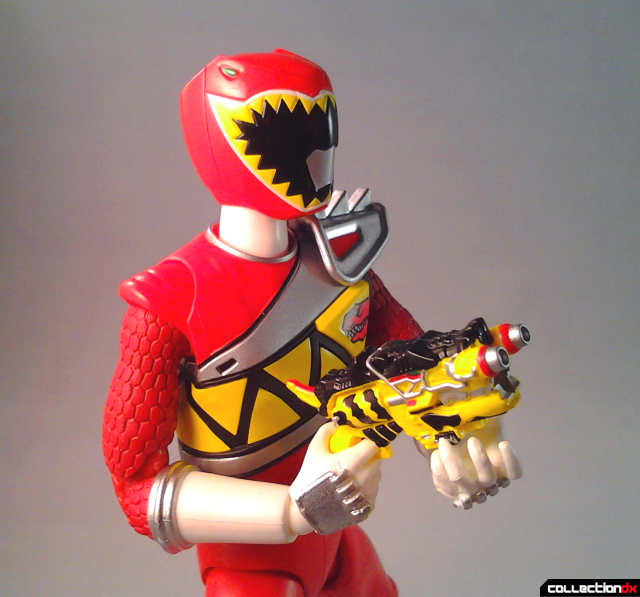 In the Kyoryuger show, the gun is used by the sentient robot dinosaurs called Voltasaurs to judge whether or not humans are worthy of becoming Zyudenryu and fighting at their sides. 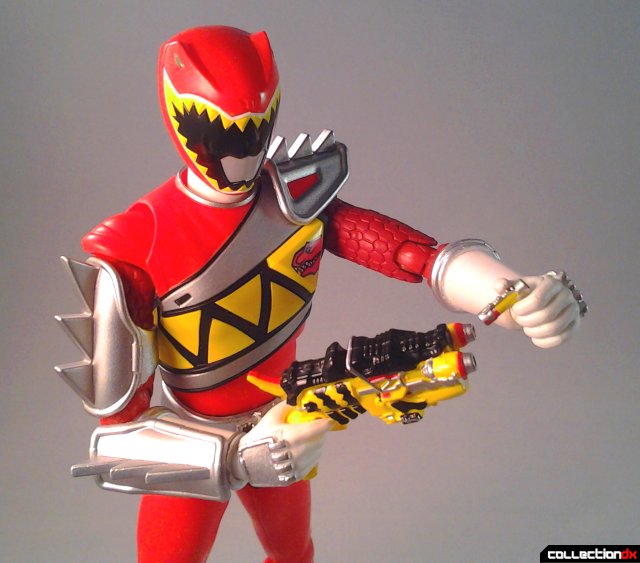 Furthermore, the guns are actually used to transform into their costumed ranger form as well. Much like the Gaburicalibur, the Gaburevolver is a busier design than the Zyuranger team's Ranger Slingers or Thunder Slingers and the S.H. Figuarts team did a great job of recreating that level of detail in a tiny accessory. Also really nice paint on this as well. In keeping with the Voltasaur theme, before you can fire the Gaburevolver, you have to plug in a Beast Battery. The S.H. Figuarts naturally comes with a Beast Battery. Unfortunately, it's not actually functional. You can't even slide the battery into the Gabureolver. 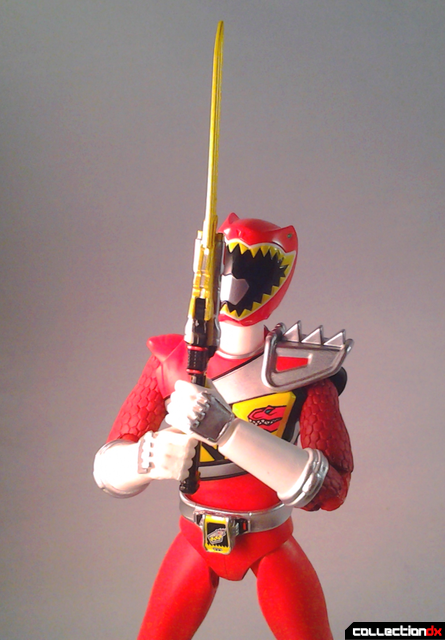 But you can pose your Kyoryu Red like he's going to. Worth noting that the Beast Battery itself, despite being about the size of a grain of rice, is nicely detailed and has three different colors of paint on it. It is also extremely easy to lose. I just lost it! "Watch out for my tiger-striped Nerf gun! It's Nerf or nothin'!" As with most modern S.H. 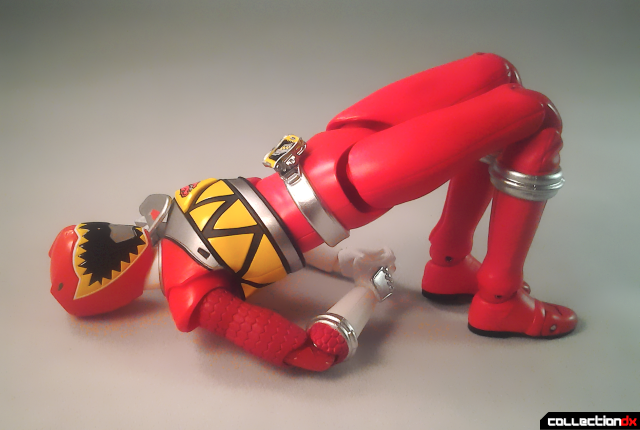 Figuarts, you can pull the legs down from the hips from a hidden joint, allowing you to achieve poses most action figures are incapable of. 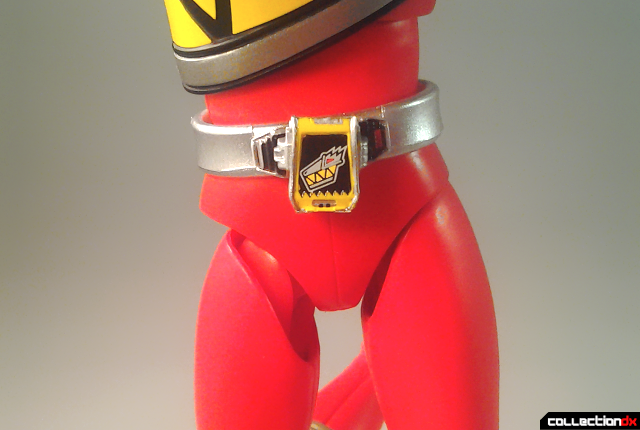 You can make Kyoryu Red cross his legs and put his arms behind his back. No seriously, does that look comfortable? 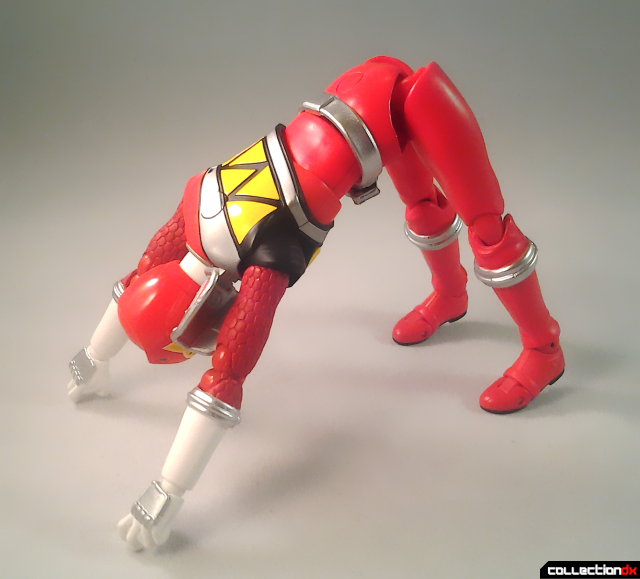 No, but Kyoryu Red is pretty flexible. He can even dance and his shoulder armor cleverly does not impede the movement of his arms! Plus he comes with four sets of hands and his belt buckle is poseable so you can make him look sloppy and drunk. 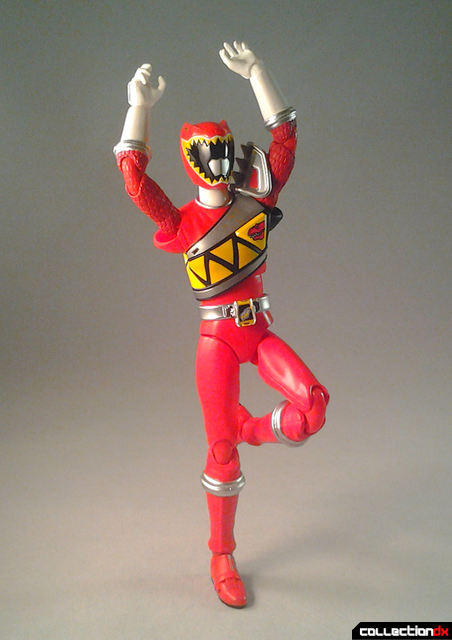 In fact, Kyoryu Red's articulation is so good he can pretty much do yoga! I'd like to see you pull this move off. 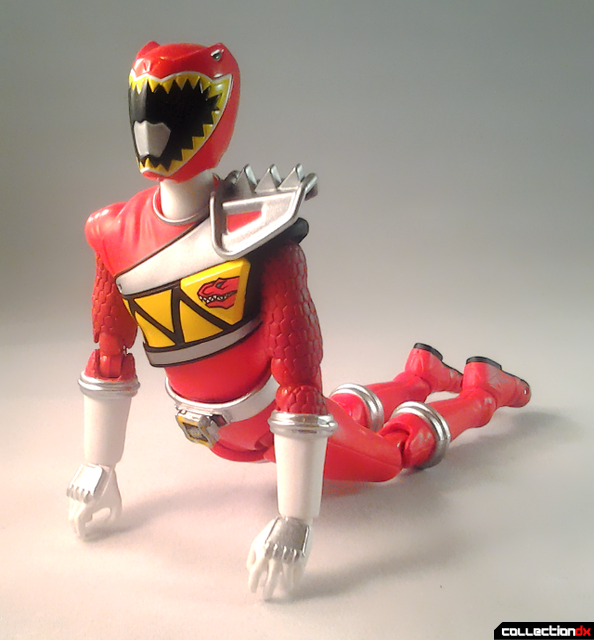 Admit it: Kyoryu Red has more articulation than you do. He can even do the crane move from The Karate Kid. Don't miss with a guy with a dinosaur sock puppet. S.H. 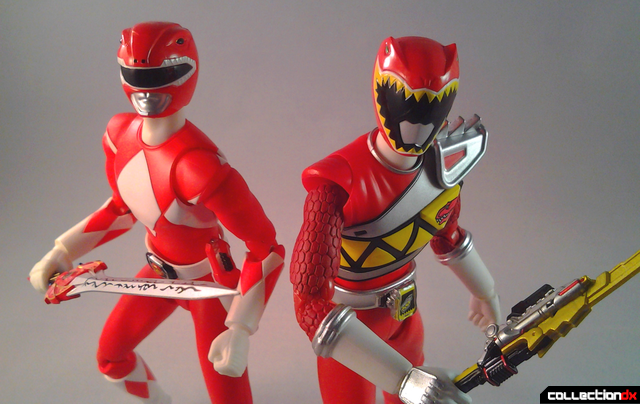 Figuarts toys are consistently great action figures and Kyoryu Red is no exception. But there are some Figuarts with little problems. The White Ranger/Tiger Ranger has breakable shoulder armor, Masked Rider X's head likes to fall off and is hard to get back on, and the original version of Masked Rider Black RX could barely turn his head. 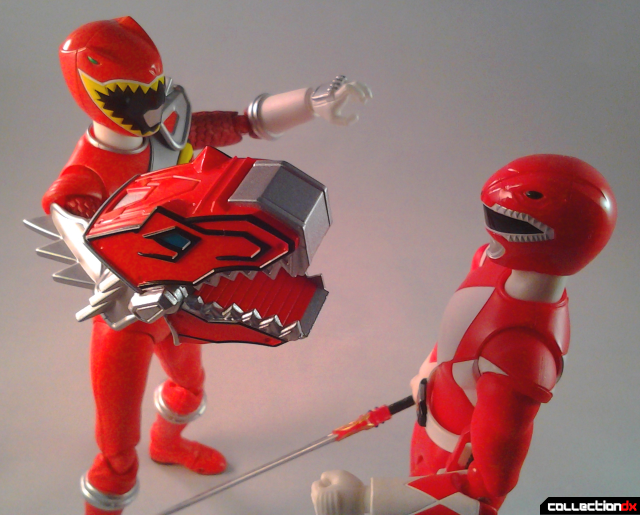 Kyoryu Red has no problems like that. The only things I can think to complain about are that I am not the biggest fan of the helmet design from the TV show lacking humanoid facial features and I suppose it would be nice to get spare Beast Batteries since I immediately lost the only one it came with. 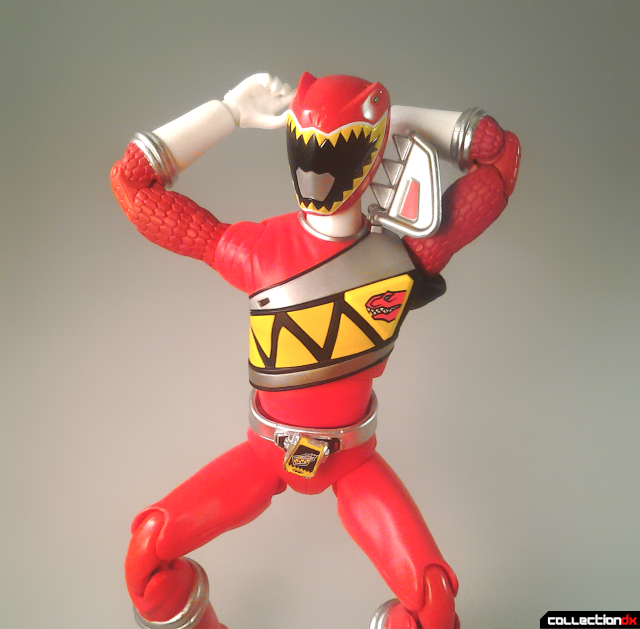 This is close to a perfect action figure and looks just great with your Zyurangers. Get it at at Angolz.com.